A complete reader on Medical astrology. The book deals with the application of Indian astrology to Medical aspects and treatment of diseases and relates them to principles of Indian astrology. More than 100 case studies are analysed in detail. A complete text book on Medical Astrology. Contains extensive chapters on remdial measures as praticed in astrology as well. 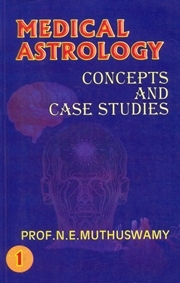 First volume, Concepts and case studies -in Medical Astrology -- Starting with the Basic concepts of Indian astrology as relevant to Medical Astrology are presented. Then a set of case studies are presented for understanding the application of astrological principles and how they could be used for analyzing the diseases and their onset for a native, as available from horoscopes.